Synthesis, characterization and investigation of antibacterial and antifungal activities of twelve camphor based 2,4-disubstituted 1,3-thiazoles is presented. Their structures were determined using NMR, IR, FAB MS and HRMS analyses. Among the derivatives, 3i and 5 were found to exhibit antifungal and antibacterial activities comparable to that of fluconazole and ciprofloxacin against yeast belonging to Candida spp., MIC 0.12-0.98 μg/ml and Gram-positive bacteria including both pathogenic S. aureus and opportunistic S. epidermidis, MIC 0.98-7.81 μg/ml, B. subtilis and B. cereus, MIC 3.91-31.25 μ g/ml, and M. luteus, MIC 0.98 μ g/ml species, respectively. 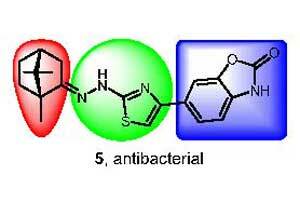 Molecular docking studies of all compounds into the active sites of microbial enzymes indicated a possible targets SAP and NMT, thiazoles 3a-j, 4, 5 showed more favourable affinity than the native ligand. Antifungal drugs, gram-positive bacteria, molecular modelling, thiazoles, terpenes, thiosemicarbazones.